LOST IN VENICE, PART 4: THE SPIRIT OF FUMAAAR! Due to a satisfying dinner behind us and adventures unforeseen ahead, we needed a little din-Euro. (Get it?) So we got in line at the ATM and suffered in silence while this drunk American kid behind us strangled a great American movie quote over and over. I decided this could go on no longer. ANYHOO…our first night in Venice turned out to be fairly abbreviated. After all the walking and being lost…then being found and being fed…it was time to find our way back to the apartment. If we could. DrunkAmericanSoldier: Hey — er, scusi! Do you know where the train station is? Jon: Yeah, man. It’s back where you came from. DrunkAmericanSoldier: Oh, thank God! You’re American! You speak English! Are you sure? I’ve been wandering around for hours! Jon gave him precise directions, and the guy thanked him profusely, tilted his alcohol-swolled-up head in the direction Jon pointed, and then tried to keep up with its momentum as he tottered out of the square and disappeared into an alley. Me: You know where the train station is? Me: Do you know how to get back to the apartment? …and got out of the apartment around a bright and early 3:00 p.m., refreshed and hungrier than a hungover frat boy just released from the drunk tank. We had two basic goals: eat (naturally), and find Piazza San Marco (St. Mark’s Square), where we assumed all the cool stuff was happening. Our apartment was located in the quiet sestiere of Dorsoduro, a good 20- to 30-minute walk from Piazza San Marco…and what a lovely walk. 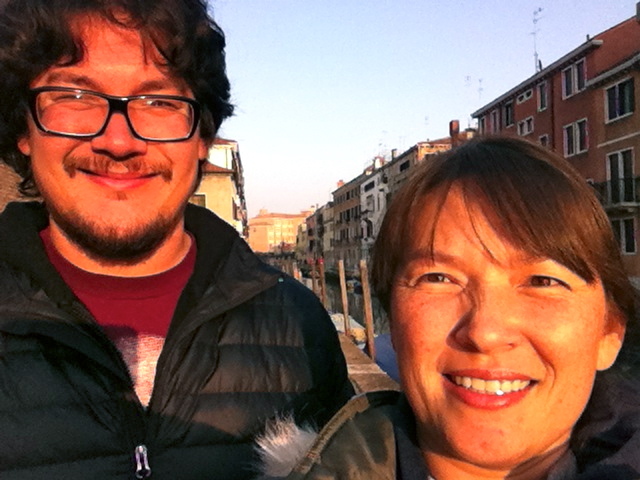 We weren’t far from the Universitá Cà Foscari Venezia, the Peggy Guggenheim Collection, the Gallerie dell’Accademia (the largest collection of Venetian art in existence¹), and a beautiful elementary school, a dream place for any artist or writer. Can you imagine a commute that looked like this? In the spirit of tourists of all stripes, we wondered out loud what it would be like to live here in this strange land of water and bridges. Naturally, Venetians face the same everyday situations everyone else does…like moving…just with different considerations. I confess, we hung around for a few minutes waiting to see if they were going to drop that fridge in the water. Disappointed, we moved on. One of the crazier things about Venice is the frequent flooding. Many buildings bear high watermarks demonstrating this fact, and indeed, a ground-level apartment is not the most desired place to live because of the mold and deep chill. Therefore, in many of the buildings, the first floor is not inhabited…which is why you’ve got fireplaces starting at the second-floor level. About as crazy-cool as all the rooftop TV antennas in Rome. I love Italian sensibility…. And then we saw Smurfs. Kind of reminds me of Hollywood Boulevard! Haven’t seen this many flip flops since Venice Beach! Oh, and this is my brother Jon and me. We were squinting because we were facing the setting sun, and we were smiling because we were about to eat. This was pretty much the last normal moment we had this day (not including the Smurfs and Bovine sightings). And it was a good thing we ate…because as we set out from the restaurant in search of High Adventure, little did we know we were about to take a tumble down the rabbit hole…and what a fine rabbit hole it was…. ¹ Boulton, Susie, and Catling, Christopher, Venice & The Veneto (London: Eyewitness Travel Guides, 2004), pg. 130.